We’ve all been there – looking for a job, lacking a paycheck, and searching to find ways to cut back on spending. That’s why Movin’ On Up has compiled a list of five simple and painless ways to save money while you continue your job hunt. These money saving tips will not only help your pocketbook, but will assist you in your job search as well. It’s not a secret that dressing for the job you want, and not the job that you have (or don’t) is one of the most touted tips for success. This can be hard to accomplish on a tight budget, but it’s important to look your best when going to an interview. If you don’t feel your current wardrobe is suitable for a first impression with your potential new boss, check with a friend to see if they would be willing to lend you an outfit. Another way to solve this problem would be checking local secondhand or consignment stores, such as Goodwill, the Salvation Army, or online stores like eBay. Browsing through these shops for the beginnings of a professional wardrobe can yield some unexpected and worthwhile results. Eating out often is not easy on your wallet. Instead of going out to dine, take a trip to the grocery store and buy ingredients for meals you can prepare throughout the week. There are multiple websites at your disposal for recipe ideas that are fast and low-cost. For example, at www.eatingwell.com, you can sign up and receive a free printable dinner plan for a month of easy weeknight meals for busy families. For similar meal plans, just use your preferred search engine to look for inexpensive meal options. When on the hunt for a job, it’s easy to simply drive around aimlessly and hope you come across a place you’d like to work. Instead of using this approach, hop online the night before and choose a specific section of your city or town to travel to. Visit different sections on different days and you can strategically visit every part of your city without driving back and forth past the same business repeatedly. This method will save you money spent on gas, which we all know can be a drain on your pocketbook. Volunteering and continuing your education aren’t just ways to feel good about yourself; they are also valuable opportunities for adding skills and experience to your resume. Check with your local Regional Food Bank, Boys and Girls Club, and various other non-profit centers for volunteer openings in your area. This can also prove to be an effective networking opportunity and a place to meet future employers, so don’t forget to work hard and introduce yourself to as many people as possible. For education, check out Duolingo to learn a new language, learn to code at Code Academy, or even learn about web development at W3 Schools. These specific skill sets are at very high demand and can be learned for free over the web. Many of your job searching expenses are tax deductible, including resume preparation fees and traveling expenses. 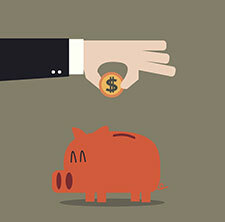 Check out www.moneycrashers.com for a list of four ways to deduct job hunting expenses. Of course, make sure to also go to the IRS website for a complete list of details and restrictions. A vast majority of job seekers are learning ways to cut costs. And, implementing these five simple tips can put you on the fast track for not only a fuller bank account, but a job as well. Do you have any other tips for cutting back on spending? Have you had success with any of these techniques for saving money and getting a job? Let us know in the comments below!